This building is FANTASTIC – inside, outside and throughout! What an honour and a privilege for Leigh, Gavin and I to attend the opening of this prestigious library on Friday 12 October. It was a terrific day for the library sector in New Zealand, and a significant day for the people of Christchurch injecting heart and soul very tangibly into the Cathedral Square/’Red Zone’ area 8 years after the quakes that devastated Christchurch. In a slick VIP launch an hour before opening the staircases to the public we were welcomed initially by local iwi who spoke with passion and confidence and obvious pleasure at this new addition to their domain. Thereafter the Deputy Mayor Andrew Turner, who subsequently carried on as MC, introduced the excellent ensemble of speakers who all interlaced beautifully without overlapping in what they had to say. Chris Hay, as the inaugural Tūranga Manager held a commanding presence in the library sector in Wellington until earlier this year, clearly joined in the Christchurch City Libraries ‘family/welcoming’ vibe described above, experienced by myself since 1991 (it has long characterised CCL and Canterbury Public Library as it was known until 2000). Chris will bring people-centric professionalism to Tūranga – smart recruiting! Representing the future members of Tūranga was a delightful youngster – who self-described as “Hello, my name is Miriam and I am 6 and one quarter years old”… and what an inspiration she was to listen to: “I love reading books, and there’s a slide, and there’s a cave, … and LEGO too… “ she told a captivated audience standing on a chair behind the podium (provided by the chivalrous Deputy Mayor)… she put a tear in the audience’s eye (well, I certainly choked up with pride and aroha nui for the library sector anyway!!) and drew significant applause. Carolyn deserved her time in the sun, she leads the hard graft and tireless effort of all the Christchurch City Libraries staff who have done the hard yards – in addition to their day jobs in adding Tūranga to New Zealand’s library fabric. And she acknowledged she was but one of many inside Christchurch City Libraries, the City Council, and the various local and international firms that helped them get them through to opening day. The word on the street is Carolyn is one of the team who worked very hard to ensure the library took pride of place in Cathedral Square as part of the regeneration-Christchurch program… terrific vision as far as I am concerned! We broke for a musical interlude with the Global Voice choir who sung a hīmene and an African chant of celebration… nice touch! And then came the Mayor – equally proud of the latest addition to her city. Lianne Dalziel recalled the first Canterbury Public Library… the brickwork, the staircases, the books – and even the distinctive smell (she didn’t elaborate! )… Tūranga – translating to the Foundation was “designed by and made for the people of Christchurch” and is the flagship library for 19 branch libraries she told us… “It is jam packed with new experiences, technology and knowledge and I hope it will excite children into dreaming about their future and the part they can play in shaping our city and our world.” … “Nearly 2500 public ideas helped the designers develop the final plan, and many of those have now come to life inside the building. 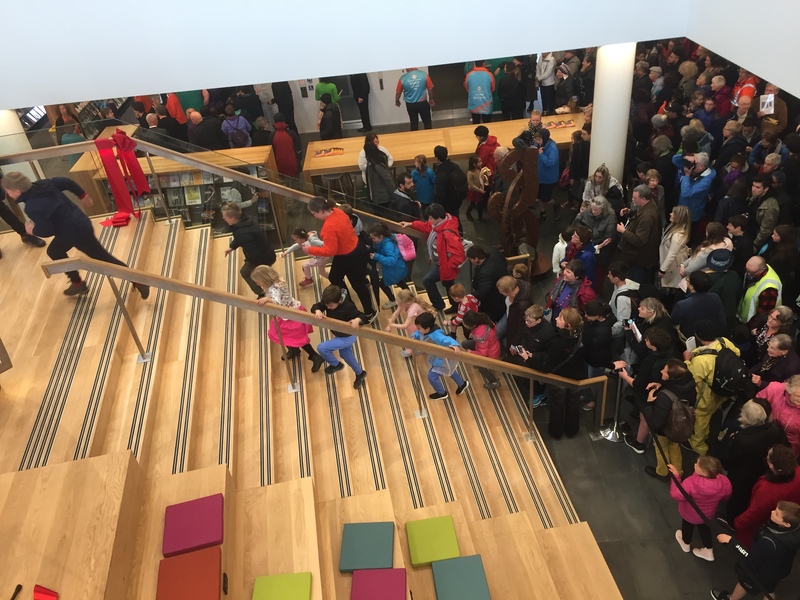 I’m confident that every visitor is going to feel very proud of their new central library.” Mayor Dalziel unveiled a plaque and then took Miriam and Barbara down to the grand staircase to speak to the public, and cut a ribbon symbolically opening New Zealand’s library just after 1pm. As well as housing more than 180,000 items, Tūranga holds a suite of technology features including New Zealand’s largest digital touch-screen, the Discovery Wall, on the ground floor which allows users to swipe through a virtual world of photos, videos and information. We are particularly proud of this and the Local History/Research space because NZMS has spent nearly three decades contributing to the content available in the library and online through preservation microfilm, digitisation services, and supplying equipment. 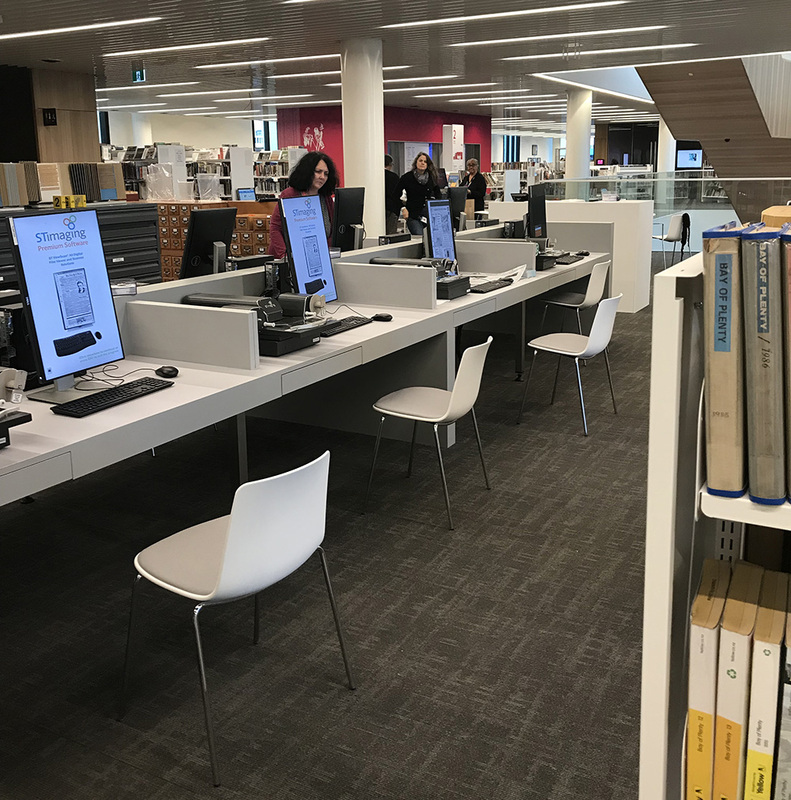 And of course, every modern library has a music studio, video editing suite, 3D printing, robotics, exhibition spaces, a conference room, café, technology space, community arena and a children’s play area! 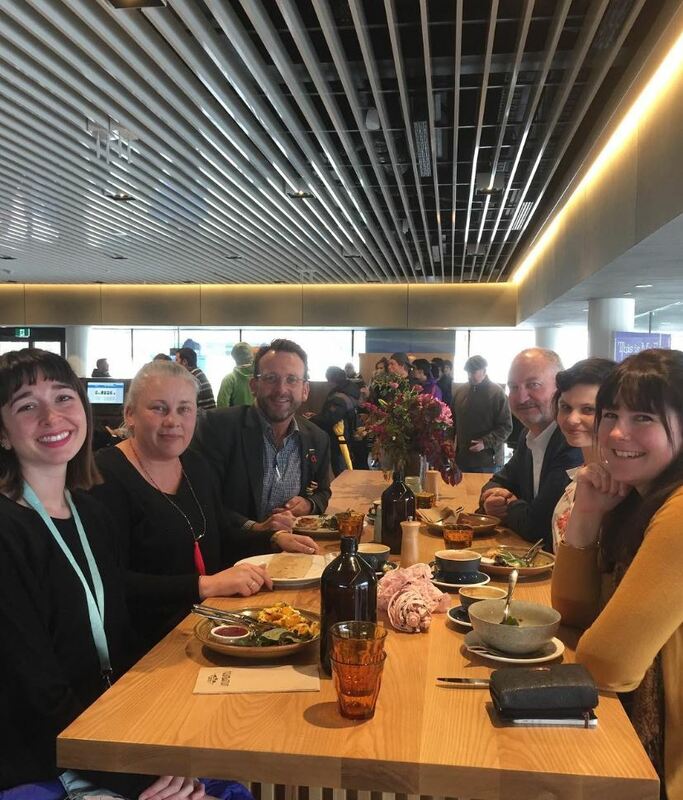 Sitting amongst librarians from around New Zealand, and later seeing so many librarians amongst the throng of local residents, gave me great pride to be part of New Zealand’s library community. So much more than books, libraries are a vital part of any nation’s (knowledge) economy, cultural fabric, identity and soul… Tūranga – New Zealand’s newest BIG library – and is indeed FANTASTIC! It will be a cultural hub and civic space for Christchurch and undoubtedly bring thousands back into the central city… a place… a ‘living room’… for Cantabrians … Sooo why not finish with a bite to eat and a cuppa with our family – most of the NZMS Christchurch crew came and joined us for a looksy and lunch at the Foundation Café … amongst at least 20 other excited librarians from around New Zealand that I could see and truckloads of happy Cantabrians.